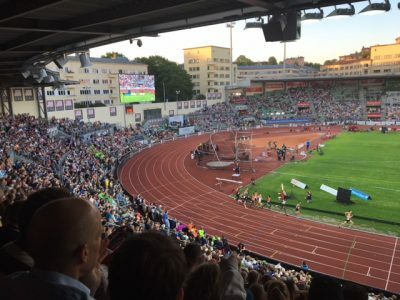 None of their Norwegian athletic heroes won Thursday night, but local sports fans nontheless filled Oslo’s iconic Bislett Stadium for the annual Diamond League event known as Bislett Games. Now its future is in doubt, because of a lengthy construction project needed to expand Oslo’s metro system right under the stadium. Around 15,000 spectators clapped and cheered for all the winners even when Norway’s World Champion hurdler Karsten Warholm, who made his entrance to the stadium waving from a car from one of his sponsors, was beaten in the 400-meter race by Abderrahman Samba from Qatar for the second time this season. The Ingebrigtsen brothers didn’t win either, although the youngest, 17-year-old Jakob, broke his own personal record in the men’s 1500-meter race, by three full seconds (3.36.06) and won respect by finishing third in a race with much older and seasoned competitors, behind Robby Andrews of the US and Chris O’Hare of Great Britain. His older brothers Henrik and Filip placed sixth and fourth respectively in the “Dream Mile” race that was won by Elijah Manangoi of Kenya and ended the evening’s five hours of track and field events. Fans didn’t seem to care and were full of praise for the brothers as they wandered around the emptying stadium for more than a half-hour after the races were over, signing autographs and posing for selfies. “This is what makes Bislett so special, it’s why we’re all here,” Gjert Ingebrigtsen, the brothers’ father and coach, told state broadcaster NRK. “It’s for the public and to contribute to getting children and youth to want to run.” Other Norwegian heroes and heroines like hurdlers Isabelle Pedersen, Amalie Iuel and Line Kloster also greeted fans and attracted cheers, and even a hurdle blunder during the women’s 3,000 meter race seemed to be forgiven on Friday. 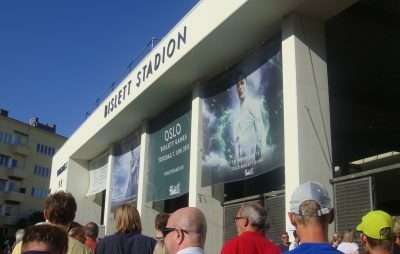 Bislett Stadium itself, however, was in the news again this week because of how a new metro (T-bane) expansion project threatens to shut it down for several years during the construction period. Part of the stadium, which dates from the early 1900s and hosted speed skating and other events during the 1952 Winter Olympics, may also need to be torn down. Bislett, moreover, was fully renovated and improved just 14 years ago at great expense after nearly a decade of political debate. The portion under the threat of a wrecker’s ball can be rebuilt again, but stadium supporters worry that the interruption caused by the new T-bane line project (which will include a station at Bislett) could fatally interrupt the momentum it’s enjoyed in recent years. Organizers of the Bislett Games didn’t have to attract any international stars this year, for example, when Norway has so many track and field stars of its own and a classic stadium to host them. Now it may need to check out of the international Diamond League, at least temporarily. Officials at Bislett Alliansen, which arranges Bislett Games, fear it may be difficult to mount a comeback after an absence of several years. Newspaper Dagsavisen editorialized this week that Bislett is also Oslo’s “most important arena for school-, local- and elite athletic events,” with a lack of an alternative facility. Top city politicians claim they don’t want to see any portion of Bislett torn down and that it will take time before any T-bane construction plan is approved. “We’re still in the early planning phases and there’s a lot to decide before we land on any solution,” the city government politician in charge, Rina Mariann Hansen of the Labour Party, told Dagsavisen on Friday. Organizers of the Bislett Games were sending “See you next year” messages around the stadium’s newsreel when Thursday night’s event ended. Its date has been set for June 13, 2019.